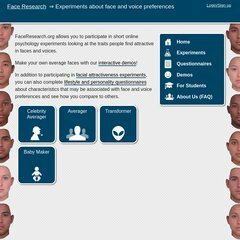 Topics: Face Research, Interactive Demos, Facial Attractiveness Experiments, Averager, and Transformer. Age: It went live on September 28th 2004, making it over 13 years, 6 months old. The site has about 515 users daily, viewing on average 2.90 pages each. eonhuman.com EON Human Blog - Turn a face photo into a 3D model! It is hosted by University Of Aberdeen Uk (Scotland, Aberdeen,) using Apache/2 web server. mailhub1.abdn.ac.uk, and mailhub2.abdn.ac.uk are its DNS Nameservers. The programming language environment is PHP/5.3.9-ZS5.6.0 ZendServer/5.0. Its server speed is measured at 813 milliseconds.